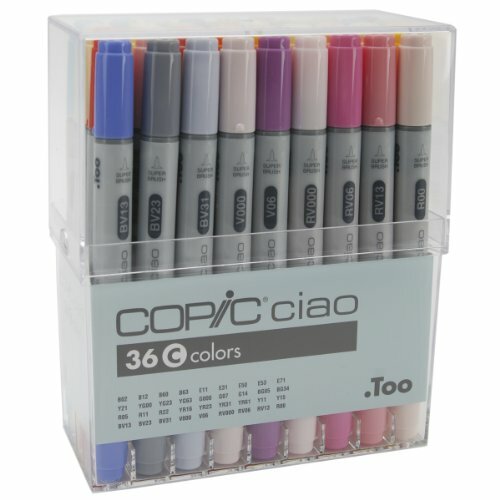 COPIC MARKERS-Copic Ciao Markers. The perfect choice for beginning artists. These round shaped pens are made specifically for those who want to try markers for the first time. Solid polypropylene body is both smooth and comfortable for a perfect controllable grip. These double ended markers with durable polyester nibs come with a Super Brush and Medium Broad nibs. Ciao markers are refillable and the inscriptions and symbols on the body are wear resistant. Each of these sets include 36 markers (no duplicate colors between sets). Markers are low-odor; blendable and for use on paper; leather; wood; fabric; plastics; faux fur and more. Packaged in a durable acrylic storage/display box: 6 by 5-1/8 by 2-1/2-inch. Imported.